You really don't need to know much Spanish to recognize that the phrase "Los Angeles" means "The Angels". And that's a good start if you're interested in the history of L.A. But if you'd like to time-travel with me, there's more. 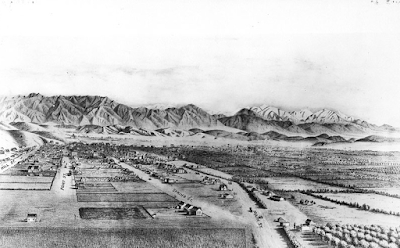 When what is now called L.A. was first established in New Spain, California, it was given the impressive name of "El Pueblo de Nuestra Señora la Reina de los Ángeles", which translated into English means "The Town of Our Lady the Queen of the Angeles", which of course is Mary, the mother of Jesus. New Spain was a Christian place, and specifically Catholic, and the first Europeans who settled there permanently were Catholic priests, from Spain. If you know your California history, you know that a Mission was built about every thirty miles, which was an average day's ride for a horse in those days, from San Diego to San Francisco. And of course towns grew up around these places, especially if they included a Presidio - which is fortified place. This was the King's Highway, and the King was the King of Spain. You can still see signs in various touristy places that mark "The Camino Real", the King's Road, although nowadays the exact route has been blurred. If you really want to know where the road was, just get on a horse and take the most direct route from Mission to Mission. Nowadays it's scenic, then it was just efficient. By the time Richard Henry Dana, Jr. saw California, in the 1830s, it had long since belonged to Mexico, and anything of the "old glory" of New Spain had faded away. His description of the area was mostly of ruined Presidios, and Missions. He wrote the book "Two Years Before the Mast" about his experience there as a young man. By that time, El Pueblo de Nuestra Señora la Reina de los Ángeles was simply referred to as "El Pueblo" - the town. Just a sleeply little Mexican town about thirty miles from the Port of San Pedro. 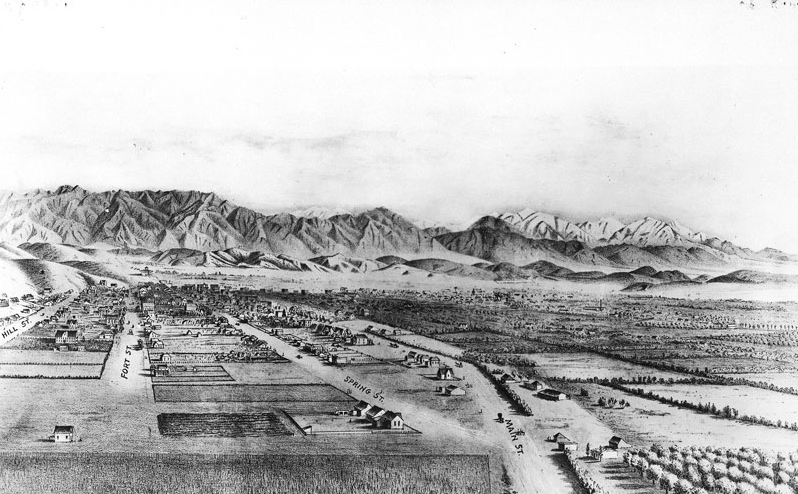 After 1849, when the United States took possession of the area, the increasing use of the English language started to change the name from "El Pueblo" to "Los Angeles", probably because the full name was written on maps, and it was just too long to say. And naming a town "The Town" wasn't very helpful as new towns appeared in California. It just makes sense. By the way, the correct mispronunciation of Los Angeles has varied over time. Spoken correctly in Spanish it would be LOs AnGeles, that is, with an "o" sound in the Los, and a hard "g". Nowadays I usually hear LAS AnjelAs, with an "a" sound for the "o" in Los, and of course the "j" sound for the "g" and an "a" sound for the last "e" In old movies I'll often hear it pronounced "LAS AnjelEs, with a distinctive long "e" towards the end. Knowing how to properly mispronounce place names is very important for locals, who can tell right away if you're from out of town by pronouncing the names differently than they do. It's true wherever you go, and here in Arizona, where I live now, being able to pronounce "Prescott" and "Mogollan" tends to be the stamp of a true local. Speaking for myself, I get a big kick out of learning the names of things, but ultimately I know that a rose by any other name will smell as sweet. But if you ask me to say the full name of Los Angeles, be prepared to see a big grin on my face, because I love that kinda stuff!